I’ve been busy crafting a little side project over the past few months, as of Monday the 9th March my freshly baked web design blog finally went live. 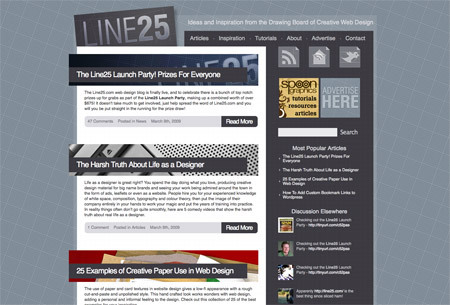 Line25.com takes on a similar structure to Blog.SpoonGraphics, but with a focus on web design articles, tutorials and inspiration. I’ve absolutely loved the process of developing Blog.SpoonGraphics, and while I’m excited to continue progressing this site into the future, I fancied the challenge of starting over with a second site. After much domain searching I finally settled on the name Line25, and developed the tag line of Ideas and Inspiration from the Drawing Board of Creative Web Design. Line25 is now live and is currently populated with a few introductory posts to give an insight into the upcoming content for each category. One of the major posts that I’m sure will be of some interest is the Line25 Launch Party. I’ve teamed up with some of the best companies that are in touch with the creative community to gather together a range of prizes and gifts that are being given away for free! With a combined price of $700 that’s some serious kit! Head over to the Line25 Launch Party post to find out more about the gifts and how you could be placed into the prize draw on Monday 23rd March. Also be sure to sign up to the RSS or Email feed to stay up to date with the new content. 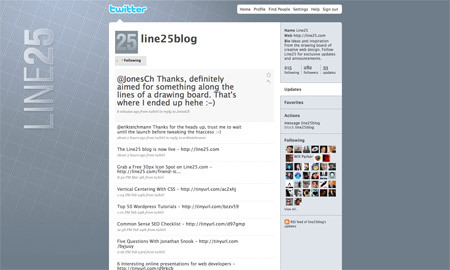 You can also interact with @line25blog on Twitter, where interesting web related links are posted on a daily basis, as well as exclusive Line25 updates and announcements. A big thanks to all those who followed the development of the site on Twitter, and best of luck to all entrants to the Launch Party! Awesome site Chris! Look forward to more good reads. hey I’ve been a great fan of your blog, full of inspirations, ideas, freebies and tutorials. I already visited line25 and it’s clean, simple and more serious i think. anyway all the best! keep the blog running! I’m looking forward to many good things from this site. You’re stuff is really good. As someone who has admired your web design skills for a long time, I gotta say one more time: Congrats on the new site. I look forward to the great content you’ll provide! Good Luck! Great design! I have one question about the code though: how did you get the post headings to stick out of the left of the layout without causing the overflow-x scrollbars to appear? I have a feeling it has something to do with the negative margins, but I can’t seem to replicate the effect without causing that scrollbar to appear. Finally a great blog devoted to web design. not bad, wish You luck to have enough ability to manage both blogs! Congrats on the new site Chris. I love the design! Another great RSS feed to add to my list. @Chris Spooner, good site, I just noticed a formatting issue with the links at the top though! I’m using firefox 3 on a PC, and the Contact link is pushed down a line. @Andrew – best way to push things outside of a container box like that is to either use a negative position relative, or a negative margin (making sure to still give the object the position:relative; property, which is what Chris did in this case). Sweet new site, I’m keen!